Some booths / stands at #IHRSA15 show need to come with a health warning 'do not try this in your own gym' the demonstrators on FreeMotion show how they can interpret 'free'! Downtown LA is full of Beaux-Arts and Art Deco gems including the Higgins Building where the Edison, a post industrial steam punk nightclub in the basement played host to the @matrix party at #IHRSA15 and the boys from @jubileehall look electrified when the hostess explained the basement contained LAs first privately owned power plant. 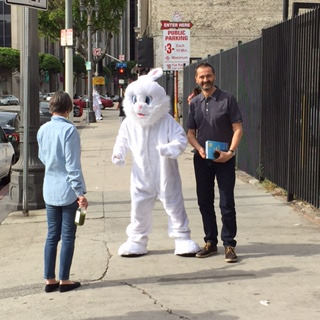 @RayAlgar is questioned by a white bunny on Downtown street in LA post #IHRSA15 about his Low Cost Gym report. 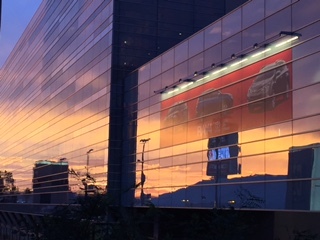 Sun setting on a great #IHRSA15. Work over and now time to enjoy a well deserved break American style!